New England Aster and Sneezeweed  Two native species that are thriving in restored areas at Hastings River Flats Park. In 2002, Friends of the Mississippi River prepared a management and restoration plan for Hastings River Flats Park, located along the Mississippi River at Lock and Dam No. 2 in Hastings, Minnesota. The following year, we began on-the-ground management and restoration activities based on the plan. Hastings, one of the oldest towns in Minnesota, enjoys a diversity of natural resources in addition to its rich cultural history. Hastings River Flats Park is one of the largest natural areas in the city. The entire park, about 215 acres, is managed by the City of Hastings, though the Army Corps of Engineers owns much of it and Flint Hills Resources retains ownership of a small area. The park's roughly triangular shape is defined by the Mississippi River on the east side, Lake Rebecca on the west, and a dike on the north, adjacent to Lock and Dam No. 2. Fencing in an area along Lake Rebecca, placed there to prevent geese, dogs, and other critters from eating the soon-to-be-planted emergent plants. The park has an interesting history of uses, first for cropland and agriculture, then as a petroleum storage tank site, and finally as parkland. The most recent conversion of the site was in 1995, when the petroleum tanks were removed and the property donated to the city. Natural areas at the park include a floodplain forest of cottonwood and silver maple, a large emergent marsh, and Lake Rebecca. The park is well-known for two endangered birds species that nest there. A pair of bald eagles resides there year-round and has raised many chicks in the last ten years. A pair of peregrine falcons nest on the bluffs across the river from the park and can often be seen from the park. The Mississippi River is a globally significant bird migration corridor, making the park an excellent place to view the thousands of birds and dozens of species that pass through. Given its location in the Mississippi River corridor and the existing natural areas present, Hastings River Flats Park was a prime candidate for habitat restoration of the former tank farm area. Describe the existing natural vegetation at the site. Evaluate the ecological condition of the natural areas. Identify management needs for the natural areas. Evaluate conditions of the disturbed areas. Determine suitable habitat restoration for disturbed areas. Although it was not the focus of our work, we also sought to include a human component in our recommendations for the natural areas. Recognizing that our management plan was a smaller piece of Hastings vision for the whole park, we planned with an eye to how recreational activities could integrate well with ecological functions in the parks natural areas. 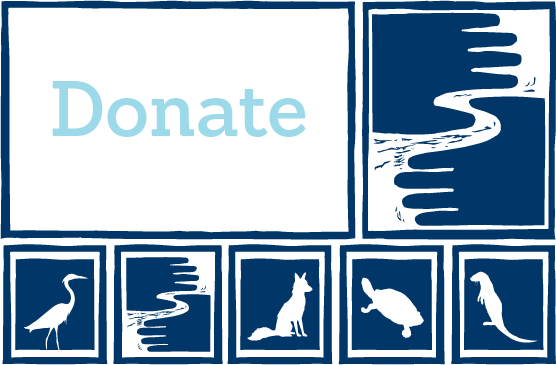 Suggestions include using restoration areas as demonstration sites, providing opportunities for natural history interpretation, and providing opportunities to involve volunteers in habitat restoration and ecological monitoring. In addition to the site and wildlife surveys, we sought public input at a community meeting to help shape the final recommendations. Through our work, we found that the 133 acres of natural area consisted primarily of floodplain forest and emergent marsh. While generally in good ecological condition, these areas required some management, especially for invasive plant species. Buckthorn removal in the floodplain forest and purple loosestrife control in areas near the emergent marsh were the most pressing concerns. restore the dam slope to dry prairie and mesic prairie. In the fall of 2003, restoration work began in earnest. First, the roughly 30-acre former tank farm area was treated with herbicide to kill the existing weeds. That November, the area was seeded with wet prairie and wet meadow seed mixes. 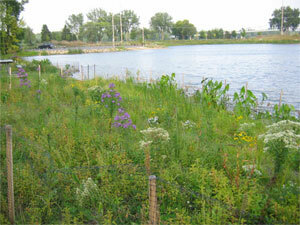 A former swimming beach area of about 2 acres by Lake Rebecca was also seeded to native wet prairie and wet meadow. 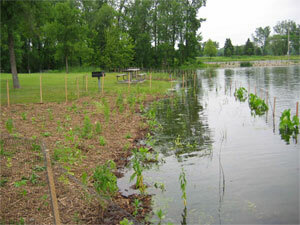 We also began lakeshore restoration at Lake Rebecca that fall. At our first event, about 30 volunteers, primarily students from Hastings High School, planted several hundred plants along part of the shore. Spring 2004 started with buckthorn removal in the floodplain forest. About 100 volunteers spent a very chilly, windy spring day hauling and stacking brush. It was so windy the tent blew away! But all the brush was removed from the woods and stacked in huge piles. The city later came and hauled it away. Now when you walk by the woods, instead of seeing solid wall of buckthorn you can see deep into the woods. Flooding along the shoreline at Hastings River Flats Park, where planting had just been completed. Also that spring, crews installed fencing along the perimeter of a stretch of shoreline about 1,200 feet long and roughly 15 to 25 feet wide in preparation for a second planting. 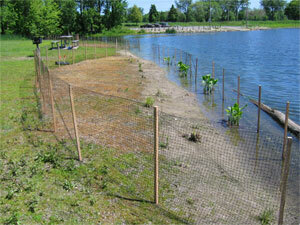 The fencing would protect new young plants from geese, dogs, and other critters. The planting itself proved to be a challenge. We had installed our fencing anticipating normal water levels in the lake. But as soon as the fence was installed, water levels began to rise due to recent rains. On June 12, 2004, 44 hard-working volunteers installed potted plants, wading in several inches of water in areas that we had expected to be dry land! Water levels continued to rise for almost two weeks. Finally, nearly a month after the planting, the water was back to pre-planting levels. Dried brown vegetation on the fencing marked the height of the flooding  about 15 inches above normal levels. 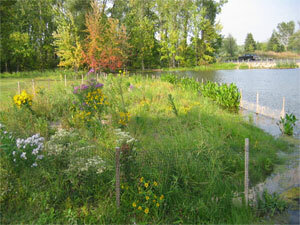 Planting unit B on Lake Rebecca, a profusion of blooms three months after planting. By the end of July it looked like the plants had survived very well. Many were blooming  great blue lobelia, swamp milkweed, monkey flower, boneset, mountain mint, wild hyssop, and blazing star. Emergent plants looked great and arrowhead was 3-1/2 feet tall. The plants continued to grow well and bloom in succession. Three months after installation, on September 13, the planting areas were a profusion of blooms. 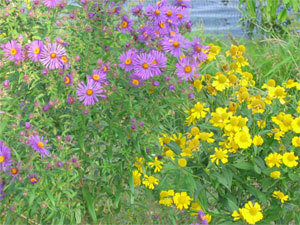 New England aster, sneezeweed, heath aster, and ironweed added their colorful blossoms to many of the previous bloomers. No doubt the cool summer was part of the reason for the long-blooming display. Planting unit A on Lake Rebecca, three months after planting. Thanks for this project goes to many sources: the North American Wetland Conservation Act, which provided funding; the City of Hasting Parks Department for all the help provided by their wonderful staff; the Minnesota Conservation Corps for installing the fencing; Bahns Landscaping for assistance with the volunteer event coordination; and to all the volunteers for their dedication, hard work and good nature!